Aanderaa RCM fitted with a Sea-Tech transmissometer ST637 11817 Located on seabed The pressure data was found to be unrealistic and was replaced with data from an alongside instrument. Conductivity values became erratic after 2002-08-09 16:55:00 UTC and were replaced by absent data indicators by the Data Originator. There is a large offset in the conductivity data, however no corrections have been performed on this channel by the Data Originator. Temperature values were changed by -0.004°C after comparisons against CTD data and alongside instruments. These data should be used with caution. Aanderaa BPR 0445 Located on seabed Temperature values were unrealistic from deployment until 2002-07-08 19:09:40 UTC. Values recorded over this period were set to absent data indicators by the Data Originator. A large offset was found by comparing the temperature channel with CTD data recorded during the deployment and recovery of the mooring. Comparisons performed against CTD data found that data from this sensor differed from CTD data by -0.095°C at deployment (CTD performed approximately 400 m from mooring) and -0.236°C at recovery (distance between CTD and mooring was approximately 590 m). Comparisons against the data from Aanderaa 11817 suggested an offset even greater than -0.236°C. The Originator did not attempt to perform any corrections to the data, and recommends that these data be used with caution. To correct for the magnetic declination (difference between magnetic north and true north) latitude values were changed by -4.4593°. All latitude values were modified by +2.8201° to correct for the compass error. Analysis of these data revealed that the midwater bins had been contaminated by interference from the recovery line attached to the ADCP lander frame. It was not possible to perform three beam correction because the long beam velocities were not recorded. Because of this the Data Originator recommends that these data are used with caution. Aanderaa RCM 10526 2 m There is a possible drift in the conductivity sensor during this deployment, however the Originator did not make any adjustments to the data. The Originator recommends that these data are used with caution. Aanderaa RCM 09631 5 m None. Aanderaa RCM 09959 10 m Quality checks revealed a large disparity between these data and the data recorded by the CTD during mooring deployment and recovery, however the Originator did not make any adjustments to the data as there was no consistent offset which could be used to adjust the data. The Originator recommends that these data are used with caution. After the mooring was recovered, the data were downloaded from the instrument logger, and factory calibrations were applied to the temperature and conductivity channels. Where available, laboratory calibrations of the current direction channels were used; factory formulae were used in their absence. Where no form factor was known for the conductivity sensor, a value of 2.8 was used. The series was marked as 'use with caution', if there were problems which the Originator was unable to correct, or it was unclear whether there was a problem with the data, such as in instances where it was not possible to perform all of the quality checks. The data were provided to BODC in ASCII format, and the series were reformatted into BODC standard internal format using a transfer function. During this process, salinity was derived from the conductivity and temperature data, in accordance with the methods outlined in Foffonoff and Millard (1982). As no pressure channel was present, the pressure used in the derivation comprised a single nominal value calculated from the instrument depth provided in the header of the data file. The table below shows how the variables within the processed data files were mapped to appropriate BODC parameter codes. - - Practical salinity of the water body by conductivity cell and computation using UNESCO 1983 algorithm PSALPR01 Dimensionless This variable was derived by BODC following Fofonoff and Millard (1983). 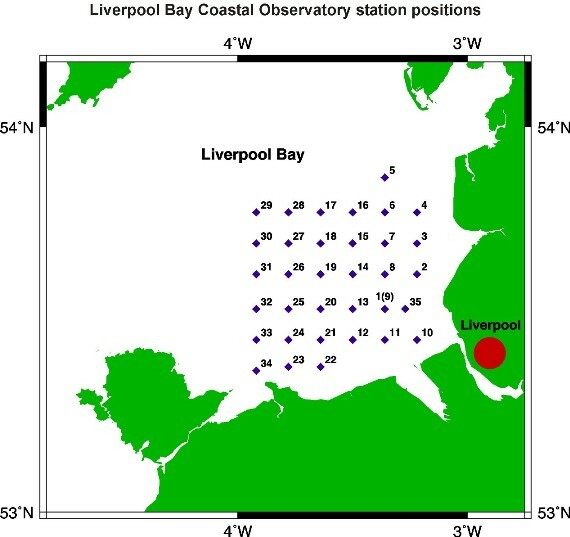 This rig was deployed as part of the Liverpool Bay Coastal Observatory during R.V. Prince Madog cruise PD020_02. The instruments were mounted on POL frame D1, which was deployed onto the sea floor. The frame was fitted with two Benthos releases (1B and 7A) and a spooler for recovery of the ballast weight. Recovery of the rig took place during R.V. Prince Madog cruise PD024_02. The acoustic releases were fired but the frame did not surface as expected. Sweeping for the rig was commenced, using a loop of wire the width of the stern. After several attempts, the frame and ballast weight were snagged and recovered. Inspection showed that both releases had fired but the frame had not surfaced because the spooler had jammed. It was noted that the frame was completely covered by a "hairy" algal growth.